Character meals are the perfect way for young and old to get up close and personal with their favorite Disney characters! In addition to character dining at the various Resort hotels, some of the theme parks also offer character meals. The characters make their way around the room, stopping at each table. You don't have to wait in a special line for pictures and autographs. Advanced Dining Reservations are available for all character meals and can be arranged by calling 407-WDW-DINE (939-3463) or by booking online. The various restaurants may have different guidelines as to how far in advance you can make your Advanced Dining Reservation. Consult INTERCOT's reference page for assistance: When to Make Advanced Dining Reservations. 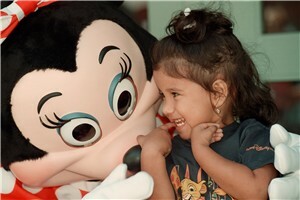 Walt Disney World offers a children's price to those aged 3-9. Choose a location, price range and character list to match your tastes. Various stations of food are presented and are all-you-care-to-eat. Available at most of the participating restaurants. The server brings large bowls/plates/skillets of food and you serve yourself. All-you-care-to-eat. These meals are served to each guest and each plate includes the same meal. All-you-care-to-eat. Character meals can be found on our MENUS page.